You know the Mom I mean. You see her in the grocery store snapping at her kids. Or at a park with her kids with her eyes glued to her iPhone. And you think some variation of "Don't miss this, Mom!" or even worse, "Why have them if you aren't going to pay attention to them?!" I'll confess I've had those thoughts, though usually not from just one moment of observation. After yesterday, I'm going to be even slower to leap to conclusions. 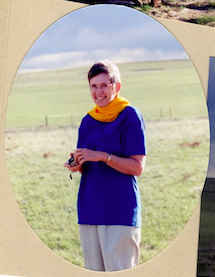 See, I haven't blogged about it yet, but my mom died this week. I got the call on my birthday, though she didn't actually die until the next morning. I'm still shell-shocked. Or numb. Or completely overwhelmed. That depends on the moment you ask. Yesterday, I had some running to do. Richard and Trina each had $50 to spend at Family Christian for their birthdays, and there was a big sale on everything in the kids' department. That meant they went along, which was a good thing. But we had to hit a grocery store, and the bank, and get crickets for the gecko, and I don't even remember what else. I melted down in the parking lot at church (we stopped there first) because the stupid truck wouldn't go into the right gear, and then I started spinning the wheels, and the kids are giggling and telling me, "Mom, everyone is staring at you!" Not my best moment. This is a family blog, so I'm not going to repeat what I said to someone who walked over to me. At least I know him, and he knows I was just a wee bit out of character. At Family Christian, the kids are bringing me adorable things like a Lego-like Noah's Ark and asking me how much that will be after the 30% off, and instead of rattling off an answer, I just stare at it and try to remember how to multiply. That wasn't so bad -- math anxiety doesn't make you a bad mother. Then we went to grab some lunch, because I knew they needed to eat something real. On the Border. So while we are waiting for a table, I'm on the phone -- ignoring my children -- trying to figure out if the van has been rented. Once we are seated, I'm on my iPad, checking email. Responding to my cousin who is expressing shock and condolences and letting me know that he'll be picking up his parents (Mom's sister) at the airport and driving them up to Fargo. Responding to someone else that no, we still don't know for sure on the funeral because we still don't know when/if they are going to get Mom out of Texas and back to North Dakota. Finding that no, I don't have a car rental confirmation in my email. Of course, I called Dad to let him know that my aunt and uncle are coming. And I had to call to try to straighten out the reservation. And I checked Facebook and responded to some condolences. And somewhere in there, I helped my kids make decisions about what to eat and I looked at my menu too. Oh, and -- I confess -- I spent a bit of time just chatting on FB with a friend. What I didn't do is pay any attention to my kids. At all. My eyes were stuck on my iPad, my ear was stuck to my cell phone, and while I can tell you what they ate, I honestly have no idea if it was good. Well, I assume so, as Trina declared this is her new favorite restaurant. I did hear that. I also heard the two of them chatting about how this was the best day ever and they were having such a good time. I wondered, briefly, what people around us thought. But honestly, I was just doing my best to get through the moment that I can't say I much cared. The grocery store too, I wondered briefly what people thought. There I was buying cases of Mountain Dew, cans of Pringles (the world's most disgusting snack food ever, in my opinion), beef jerkey, granola bars, fruit snacks, string cheese, sandwich meat, sliced cheese, bread... and I'm pretty sure that covers the contents of my cart. I let the kids push the cart, which they weren't exactly doing in a nice, calm fashion. They never ran into anyone, I will say that. But I'll also say, I'm not sure how. And I'm standing in front of the cheese display, just staring at it, trying to remember why I'm there. I'm sure someone at Super Target was thinking I don't deserve to have kids and I'm letting them run out of control. And, of course, what kind of person buys so much JUNK? And snaps at the kids too. On the other hand, there was some older guy I had noticed from a ways off, who looked a lot like me -- you know, the weight of the world on his shoulders, and like he wasn't quite sure what he was doing. He stopped his cart at one point, turned around, marched over to my goofing-off kids, and said, "Grocery shopping is serious business. You are not supposed to be having this much fun." He winked at me, and grinned when the kids giggled. So maybe not everyone was thinking I'm a horrible mom. And the bottom line is, my kids know that I'm just a wee bit stressed this week, and they understand. They are trying not to make random noises when I tell them I'm at a breaking point, and they are enjoying jumping in snowdrifts in the parking lot, or savoring a good meal. Their opinions are the ones that matter. I already was pretty good at telling myself -- when I'd see someone like the me of yesterday -- that all I'm seeing is a snapshot, a sound bite. That I have no idea what is going on in their life. Yesterday really brought that into focus for me. Take the next step. Do the next thing. I totally understand, and get where you're at. When my Dad died I was on autopilot for about two months. Your kids know you love them. We love you too! Hugs! Debra...I just wanted to say Bless Your Heart. This post brought tears to my eyes, because I so remember that life-changing moment I knew my mom had left this world, a year ago at the end of this month. I, too, felt dazed and more than a bit lost. Since I lost my dad in my 20's, I suddenly realized I was an orphan in this world, and it felt so surreal. What does one do without their parents to consult or chat with, to pour your heart out to and just take comfort in knowing they are there? It doesn't quite right not to have them. I feel for you. I really do. God bless. (((HUGS))) Just get through it the best way you know how. If you feel compelled to tell a complete stranger what you're going through, then do that...it might just give them the same very humbling lesson you just learned about judging someone in a moment that might be totally out of context in their lives. Time doesn't make the pain of the loss any better, but it does make it part of your everyday life, and you'll find your way eventually. Until then, be forgiving with yourself. It really is okay. Again, I am so sorry to hear about the loss if your sweet mom. I cannot imagine. But I am willing to be that SHE thought you are a good mom. I am also willing to bet she was more than right! HUGS, sweet friend! Oh Debra. Yes some days are just barely making it through, but since The Lord knows our hearts He knows when we need him to manage the details. Remember His strength in our weakness. There are a lot of moms that have those kind of days everyday. Maybe I am having one today. As I read your post I would get bits of ADD and just keep scrolling back to the picture of your mom. The two of you share the same smile. The kind of smile that just says that life is too much of an adventure not to smile. The fog will clear and the tears will become more sporadic. The day will return when you will once again smile that smile. You might just catch yourself in the rearview mirror at the grocery and that smile will remind you of her! Many hugs and prayers coming your way. I am praying for you and your family often. I pray that the weight will be lifted by the only one who can lift it. That He will ease your pain and lift your burdens. That He will put people in your path that help you and encourage you and remind you that you are His and He is holding you in His hand during this trial and pain. As you all move forward with all that is going on in the coming days and weeks, I pray that you will feel the love and peace that He has for you but also the love that so many others have for you. Thank you for sharing you and being who you are. You are great encourager and a marvelous mother. I am praying for you. Oh Debra, I wish I could wrap my arms around you. I remember that feeling....when my mom died I went into survival mode and could not focus on anything. It will pass. Your kids will be fine. There is grace. And dear friends who love you so much and are praying for you. Love you much. Debra, I'm so sorry for your loss. This will pass. You are a great mom. You are in shock and grieving right now, and these early days are simply a short phase. Give yourself some time. Hugs to you and your family.